Stone Temple Pilots (often abbreviated as STP) are an American rock band from San Diego, California, that originally consisted of Scott Weiland (lead vocals), brothers Dean DeLeo (guitar) and Robert DeLeo (bass, backing vocals), and Eric Kretz (drums). From the band's formation in 1989, its line-up remained unchanged until the firing of Weiland in February 2013. Linkin Park vocalist Chester Bennington joined the band in May 2013. In November 2015, Bennington left the band to focus solely on Linkin Park. On December 3, 2015, Weiland was found dead on his tour bus before a performance with his band The Wildabouts. In 2016, the band launched an online audition for a new lead vocalist.On November 14, 2017, Jeff Gutt became the new singer of the band. After forming in 1989 under the name Mighty Joe Young, the band signed with Atlantic Records and changed its name to Stone Temple Pilots. The band's debut album, Core (1992), was a commercial success, and they went on to become one of the most commercially successful bands of the 1990s, selling more than 18 million albums in the United States and 40 million worldwide. The band released four more studio albums: Purple (1994), Tiny Music... Songs from the Vatican Gift Shop (1996), No. 4 (1999), and Shangri-La Dee Da (2001), before separating in 2002, after which the band members partook in various projects (most notably Velvet Revolver and Army of Anyone). The band eventually reconvened in 2008 for a reunion tour, released their self-titled sixth album in 2010, and actively toured until Chester Bennington's departure. The band's only material with Bennington was the EP High Rise in 2013. The band released its second self-titled album, on March 16, 2018. While initially rising to fame as part of the grunge movement of the early 1990s, further releases from the band expressed a variety of influences, including psychedelic rock, bossa nova and classic rock. The band's evolution throughout the 1990s and early 2000s involved periods of commercial highs and lows, brought about in part by Weiland's well-publicized struggles with drug addiction. Two conflicting stories of how frontman Scott Weiland and bassist Robert DeLeo met have been described by the band; one was that Weiland and DeLeo met at a Black Flag concert in Long Beach, California in 1985. They began discussing their girlfriends, only to realize they were dating the same woman. However, instead of letting this come between them, they developed a bond and formed a band after they each subsequently broke it off with the girl. Weiland presented a different version of meeting Robert in his autobiography, stating that Weiland and his friends—guitarist Corey Hicock and drummer David Allin—pursued Robert after witnessing him play live with him sitting in during sets at various gigs with their band Soi Disant. Despite negative reviews from some critics, Stone Temple Pilots continued to gain fans. They toured for four weeks, opening for bands such as Rage Against the Machine and Megadeth. 1993 brought continued success on the road, with the band headlining a two-and-a-half-month American tour. In October 1995, the band regrouped to begin recording its third album, renting out a mansion in Santa Barbara, California for the band to live together during the recording process. Stone Temple Pilots released the album Tiny Music... Songs from the Vatican Gift Shop, on March 5, 1996. The album's sound marked a drastic change from their previous outings, oriented more in the direction of glam rock and psychedelic music than that of the hard rock/grunge sound that propelled them to popularity; critical reception, at the time, was mixed. Rolling Stone, a magazine known for its initial dismissal of the band's music, held a favorable opinion of the album, regarding the release as the group's best effort to date. They expressed surprise, however, at "the clattering, upbeat character of the music" given Weiland's much-publicized run-ins with drugs and the law. Stone Temple Pilots were also featured on the cover of issue No. 753 in February 1997. In late 1998, the band regrouped and began work on a fourth Stone Temple Pilots album. Released in 1999, No. 4 was conceived as a "back-to-basics" rock album in the vein of Core or Purple. Stephen Thomas Erlewine of AllMusic compared the album's sound to contemporary alternative metal bands and wrote in his review "it's as if STP decided to compete directly with the new generation of alt-metal bands who prize aggression over hooks or riffs." STP scored one of its biggest hits since the success of Core and Purple with the single "Sour Girl", fueled by a popular music video starring Sarah Michelle Gellar of Buffy the Vampire Slayer fame. The band also recorded an episode of VH1 Storytellers, and went on a summer tour with the Red Hot Chili Peppers. No. 4 would eventually be certified platinum by the RIAA. In December 2011, Dean DeLeo told Rolling Stone, "what I'd like to see happen is the band go out and do more intimate shows—really lovely theaters around the country." DeLeo also commented on a possible extended reissue of Core including live archived material, "We have tons of live recordings from that era, and we didn't multi-track record that stuff. There's no fixes, so they'd sound incredible if we just master them." On January 2, 2012, Scott Weiland also commented on the 20th anniversary of Core, saying "Well, we're doing a lot of special things. [There's] a lot of archival footage that we're putting together, a coffee table book, hopefully a brand new album—so many ideas. A box set and then a tour, of course." On November 9, 2015, Bennington announced he was amicably leaving Stone Temple Pilots to focus more on Linkin Park. On July 20, 2017, Bennington was found dead in his home shortly before 9:00am. His death was ruled a suicide by hanging. On April 2, 2018, the band announced the "Revolution 3 Tour" would commence during the summer. The tour was a co-headlining tour with Bush and The Cult. The band's sound is considered a blending of the alternative rock of the 1980s and 1990s with the hard rock of the 1970s, though the band is known for making each of their records possess a unique musical style, despite having the "sonic blueprint" of the band, as Robert DeLeo describes. Stone Temple Pilots have also been described as alternative metal and neo-psychedelia. The band Aerosmith was a large influence on the band collectively, with guitarist Dean DeLeo acknowledging the band's influence on songs such as "Huckleberry Crumble" off their 2010 self-titled record. Steven Tyler and Joe Perry joined the band onstage at a 1996 show in Madison Square Garden for renditions of the Aerosmith songs "Sweet Emotion" and "Lick and a Promise". All of the band members were Kiss fans during their childhood, and played shows at the Roseland Ballroom in 1993 dressed in Kiss-style makeup. During the taping of their VH1 Storytellers performance, Weiland acknowledged artists such as The Rolling Stones, Neil Young and Robert Plant as their musical heroes. The band has covered songs by artists such as the Beatles, Led Zeppelin, The Doors, Pink Floyd, James Brown, David Bowie, and Bob Marley both live and in the studio. Early in their career, the band was considered to be a part of the grunge movement. Despite assertions by critics that their style in the early–mid 1990s was derived from contemporary artists such as Alice in Chains and Soundgarden, the band maintained that the similarities were coincidental, due in part to having the same musical idols growing up. Much of the comparison was directed at Weiland's vocal style drawing similarities to that of Eddie Vedder's. Weiland stated that his vocal style is influenced by Jim Morrison and David Bowie, who also served as his main fashion influence. Weiland has been called a chameleon due to his ability to change his vocal and fashion style. Regarding the band's musical evolution, Weiland commented in 2014 that "with STP, we never stuck to it. We saw that even great movements only last a certain period of time and you don’t want to be pigeonholed, so we got into other things, like the Beatles were a big influence, glam was a big influence, and it morphed along the way. I’m proud of the legacy we created and where we stand among those other peers at the time." 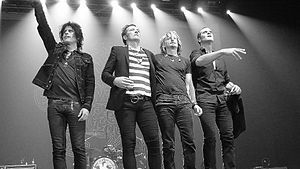 Despite being unpopular with critics in their heyday, Stone Temple Pilots have proved to be a popular and influential act. In retrospect, MTV writer James Montgomery published an article questioning the validity of music critics opinions of the band during the 90s, saying, "All I'm suggesting is that perhaps it's time to admit that we were wrong about them from the get-go—that we treated them unfairly." In a review of the band's 2003 greatest hits collection Thank You, AllMusic critic Stephen Erlewine wrote that "STP made music that sounded great at the time and even better now," and that "this music has stood the test of time," calling Thank You "nearly perfect." Erlewine also wrote that "STP was the best straight-ahead rock singles outfit of their time." ^ a b Hogan, Marc (February 27, 2013). "Stone Temple Pilots Fire Frontman Scott Weiland". SPIN. Retrieved March 3, 2013. ^ a b Sharp, Tyler (November 9, 2015). "Linkin Park's Chester Bennington leaves Stone Temple Pilots". Alternative Press. Retrieved November 17, 2015. ^ a b Newman, Jason (November 9, 2015). "Chester Bennington Leaves Stone Temple Pilots to Focus on Linkin Park". RollingStone. Retrieved November 9, 2015. ^ "Linkin Park Singer Chester Bennington Dead, Commits Suicide by Hanging". TMZ. July 20, 2017. Retrieved July 20, 2017. ^ Thomas, Stephen. "Stone Temple Pilots – Music Biography, Credits and Discography". AllMusic. Retrieved March 3, 2013. ^ "Discography & Song Info Archive". Archive.is. Archived from the original on September 28, 2007. Retrieved July 20, 2017. ^ Ticket Specialists Biography Archived April 24, 2008, at the Wayback Machine Last Accessed June 10, 2008. ^ "Discography & Song Info Archive". Archive.is. Archived from the original on June 29, 2007. Retrieved July 20, 2017. ^ "Stone Temple Pilots – Tiny Music... Songs from the Vatican... (album review)". Sputnikmusic. June 12, 2005. Retrieved October 15, 2010. ^ Thomas, Stephen (March 26, 1996). "Tiny Music...Songs from the Vatican Gift Shop – Stone Temple Pilots". AllMusic. Retrieved October 15, 2010. ^ David Browne (April 5, 1996). "Tiny Music...Songs From the Vatican Gift Shop | Music". EW.com. Retrieved October 15, 2010. ^ "Allposters". allposters.com. Retrieved October 18, 2008. ^ Stephen Thomas Erlewine (March 17, 1998). "12 Bar Blues - Scott Weiland | Songs, Reviews, Credits". AllMusic. Retrieved January 4, 2016. ^ Erlewine, Stephen Thomas. "Talk Show review". AllMusic. Retrieved January 18, 2010. ^ No. 4 – Stone Temple Pilots | Songs, Reviews, Credits, Awards. AllMusic (October 26, 1999). Retrieved on August 25, 2013. ^ "Band biography". Belowempty. Retrieved April 21, 2012. ^ "The Recorder". Clubs.ccsu.edu. Archived from the original on December 6, 2008. Retrieved September 13, 2012. ^ a b Harris, Chris (April 8, 2008). "Stone Temple Pilots Reunite To Continue 'Legacy,' Thanks To Scott Weiland's Wife". MTV.com. Retrieved January 25, 2010. ^ "Stone Temple Pilots Working With Producer DON WAS – May 28, 2009". Blabbermouth.net. Archived from the original on July 1, 2010. Retrieved January 22, 2010. ^ "Stone Temple Pilots Completes Mastering New Album". Blabbermouth.net. Roadrunner Records. February 20, 2010. Archived from the original on June 8, 2011. Retrieved February 21, 2010. ^ "Music News, Videos, Photos, Artists, Playlists and More". Rolling Stone. Retrieved October 15, 2010. ^ "First Bands Confirmed For Download Festival 2010". Metal Underground.com. January 25, 2010. Retrieved January 25, 2010. ^ "Download Festive '10 lineup". efestivals.co.uk. Retrieved January 25, 2010. ^ "Stone Temple Pilots Release self-titled album May 25!". BelowEmpty.com. February 25, 2010. Retrieved February 25, 2010. ^ "Stone * Temple * Pilots – STP Tour". Stonetemplepilots.com. Retrieved October 20, 2011. ^ Greg Prato (December 2, 2011). "Stone Temple Pilots Guitarist Dean DeLeo Talks 'Core' Reissue, Theater Tour | Music News". Rolling Stone. Retrieved March 3, 2012. ^ "Scott Weiland Talks 20th Anniversary Of STP's Core". Rttnews.com. Retrieved March 3, 2012. ^ "Stone Temple Pilots: Alive in the Windy City [Blu-ray]: Stone Temple Pilots: Movies & TV". Amazon.com. Retrieved March 3, 2013. ^ Greg Prato (May 1, 2012). "Scott Weiland Talks 'Avengers' Tune, STP Anniversary Tour | Music News". Rolling Stone. Retrieved March 3, 2013. ^ "Stone ★ Temple ★ Pilots > News". Stonetemplepilots.com. March 30, 2010. Retrieved March 3, 2013. ^ "Slash Says Scott Weiland Has Been Fired From Stone Temple Pilots". Loudwire.com. December 7, 2012. Retrieved March 3, 2013. ^ Buchanan, Brett (May 14, 2013). "RUMOR: STP SEEKING FAMOUS NEW FRONTMAN, FIRED WEILAND FOR POOR SINGING & CASH GRAB SOLO TOUR". GrungeReport.net. Retrieved May 20, 2013. ^ "New look, fresh goals for Stone Temple Pilots". Theoaklandpress.com. September 16, 2015. Retrieved July 20, 2017. ^ "Stone Temple Pilots With Chester Bennington Playing BFD 2013, Debut New Single 'Out Of Time' « LIVE 105". Live105.cbslocal.com. May 18, 2013. Retrieved January 4, 2016. ^ "Stone Temple Pilots announce shows in Los Angeles with Slash and Duff McKagan". GrungeReport.net. May 5, 2013. Retrieved May 7, 2013. ^ Tour Announced, EP This Fall! Archived August 9, 2013, at the Wayback Machine. StoneTemplePilots.com (July 15, 2013). Retrieved on August 25, 2013. ^ Buchanan, Brett (August 28, 2013). "Stone Temple Pilots Reveal Cover Art & Release Date For New Ep 'High Rise'". AlternativeNation.net. Archived from the original on October 12, 2013. Retrieved April 23, 2014. ^ Halperin, Shirley. "Scott Weiland, Former Stone Temple Pilots Singer, Dead at 48". Billboard. Retrieved December 4, 2015. ^ "Stone Temple Pilots Release Statement On Scott Weiland's Death". The PRP. December 4, 2015. Retrieved December 5, 2015. ^ McCausland, Doug (September 15, 2016). "New Stone Temple Pilots Frontman Revealed?". AlternativeNation.net. Retrieved September 15, 2016. ^ Buchanan, Brett (February 9, 2017). "Stone Temple Pilots Have 'Hearts Set' On Singer, Candidate Cries After Call From Dean DeLeo". AlternativeNation.net. Retrieved February 9, 2017. ^ Baltin, Steve (October 9, 2017). "Stone Temple Pilots' Dean DeLeo Talks Scott Weiland, Chester Bennington and 25th Anniversary of 'Plush'". Variety. Retrieved October 9, 2017. ^ Bowman, Lisa (November 2, 2017). "Stone Temple Pilots announce first show since Chester Bennington's death". NME. Retrieved November 2, 2017. ^ "New Single Meadow!". Stone Temple Pilots. Retrieved November 15, 2017. ^ "Bush, Stone Temple Pilots, the Cult Set Tri-Headlining 'Revolution 3' Tour". Rolling Stone. Retrieved 2018-06-05. ^ "STONE TEMPLE PILOTS: STONE TEMPLE PILOTS DEBUT NEW SONG". Atlantic Records. Archived from the original on July 9, 2012. Retrieved April 8, 2012. ^ Thomas, Stephen. "Stone Temple Pilots". AllMusic. Retrieved October 20, 2011. ^ Stone Temple Pilots: breaking the sound barrier. Questia Online Library. Retrieved September 26, 2012. ^ Florino, Rick (June 16, 2009). "Interview: Stone Temple Pilots". ARTISTdirect. Retrieved January 22, 2010. ^ "Rock and Roll chameleon comes out of the closet (Scott Weiland)". Accidental Genius. Archived from the original on August 8, 2014. Retrieved April 8, 2012. ^ Features and Interviews. "Scott Weiland Discusses '90s Grunge Scene". Audio Ink Radio. Retrieved July 20, 2017. ^ Greg Prato (November 21, 2012). "Scott Weiland Expects a Busy 2013 | Music News". Rolling Stone. Retrieved March 3, 2013. ^ "Hard To The Core". Belowempty.com. August 1, 1993. Retrieved April 17, 2010. ^ "Gold and Platinum". RIAA. Archived from the original on September 4, 2015. Retrieved January 23, 2010. ^ "Top Selling Artists". RIAA. Archived from the original on July 25, 2013. Retrieved January 25, 2010. ^ "Stone Temple Pilots Billboard Singles Chart". AllMusic. Retrieved January 25, 2010. ^ "Stone Temple Pilots Chart History". Billboard. Retrieved January 25, 2010. ^ a b "Stone Temple Pilots Billboard Album Chart". AllMusic. Retrieved January 25, 2010. ^ "The 36th Annual Grammy Awards: And the Grammy Goes to . . . Winners According to Category". Los Angeles Times. March 2, 1994. Retrieved January 25, 2010. ^ "Rock On The Net: VH1: 100 Greatest Hard Rock Artists". VH1.com. Retrieved January 25, 2010. ^ Montgomery, James (April 9, 2008). "Stone Temple Pilots Weren't Nirvana – But They Were Close, In Bigger Than The Sound". MTV. Retrieved April 8, 2012. ^ Thomas, Stephen (November 11, 2003). "Thank You – Stone Temple Pilots". AllMusic. Retrieved April 26, 2012. ^ a b c d e f g "MTV VMAs 1995 - MTV Video Music Awards 1995". Awardsandshows.com. Retrieved July 20, 2017. ^ "Movie Awards 1995 - MTV Movie Awards". MTV. Retrieved July 20, 2017. ^ "VMA 2000 - MTV Video Music Awards". MTV. Retrieved July 20, 2017.